We don’t keep the secret that we are friends with Moustache®, but this friendship is not sprung from chance or corporate duty, it’s the deals 123Ink.ca & Moustache® work to bring you all year around. Now with Black Friday Deal & Cyber Monday Sale approaching, the all-purpose Racing Car Gaming Chair, Computer Desk Chair is on blowout, FREE shipping included. While the chair’s name may not make seem so, this chair is for everyone from the competent gamer to an accessory for a home office space. The modern design of this office chair comes equipped with a headrest and comfortable armrests, giving you comfort throughout the entire chair. The chair looks great with a sleek red and black PU leather, if that doesn’t tickle your fancy, the reverse colour layout is available. If red isn’t your colour, it is also available in blue. This chair is an excellent addition to any home office. The modern and supportive design provides stability and comes equipped with thick padding on pressure point areas. 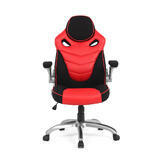 The 360-degree swivel and lumbar support will keep you comfortable for late work nights in your office. Moreover, the sturdy built-in support will keep you comfortable throughout long gaming sessions, tempting you to use the chair not only for PC gaming at a desk but in front of your television for console gaming. If your gaming, you may not be a stranger to a soda pop spill or rubbing grease off on surfaces before gripping the controller once again. Few chairs keep that in mind, and it is annoying to wipe chip crumbs on your sweatpants over and over and over. The PU leather’s upholstered face allows easy cleaning, so you don’t have to worry about eating, working, gaming, and drinking in a comfortable and excellent chair. 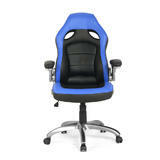 The leather is also durable, lost lasting, and a solid solution for a long-term gaming or regular office chair needs. The Best Black Friday 2018 Deals on Printers, Ink, Toner, and More!